You must be an engineer! So, your Dad is then, right? Or maybe your Grandpa? No? But you want to build an airplane anyway. Well, what can we say? Maybe you’d better start with a paper one. No, we’re not talking about the ones you made out of your school math test. OK, maybe those too. 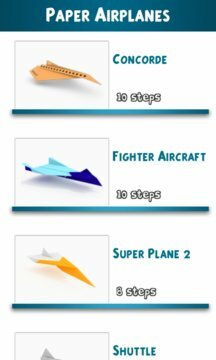 But we’re also talking about tens of incredible paper airplane models: flying ones for you pilots-at-heart, and stationary ones for the true builders among you. And you can download them all for free. If you’ve ever dreamed about building a bomber or a modern fighter jet, that doesn’t mean you love war; you just think planes are cool. We understand you completely. All right, are you ready? Go get a piece of paper. 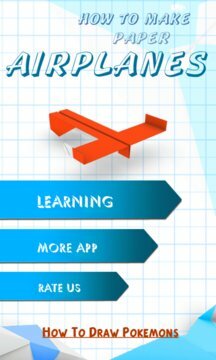 The ‘Making Paper Airplanes’ app is simple and easy to use. Follow the step-by-step instructions and watch the 3D animation carefully. And don’t worry, you’d have to try really hard to get confused. By the way, making paper airplanes, like origami, develops logical reasoning, attention span, spatial thinking and fine motor skills. Consider that when you’re trying to keep your fidgety kids busy. Do you dream of building an airplane? Maybe you’d better start with a paper one. Our app will help you with it!